There has been a thought floating through my mind that I want to throw out there. Unfortunately, like so many of these topics, there needs to be a “setting of the stage” so please be patient. 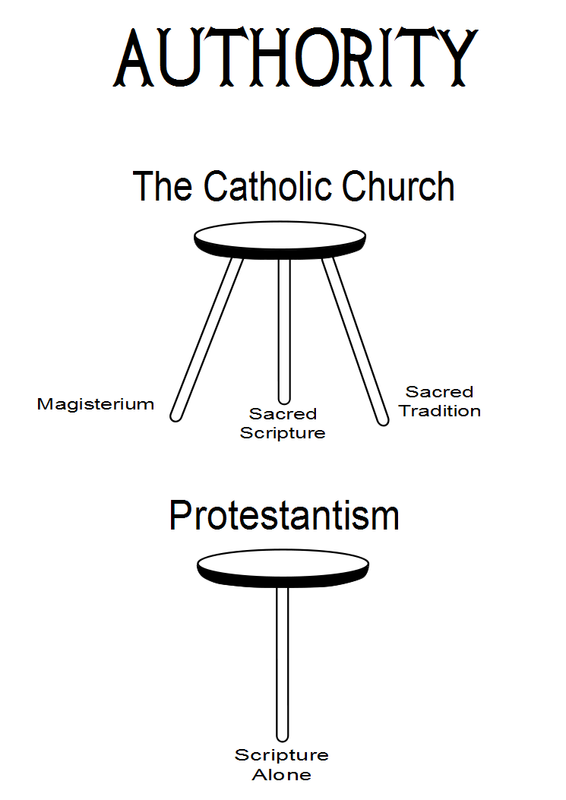 So far as I understand the issues, the Roman Catholics hold to a three-legged stool of authority (a trinity of sorts); Sacred Scripture, Sacred Tradition, and the Magisterium. To the Catholic, these three work in harmony together to form the doctrines of the Church. Because of the nature of apologetic discussions, Catholic apologists may often stress one leg over another depending on the conversation and the need to make a point. For example, when discussing “where we got the Bible” they may stress the need for a Magisterium. The Bible itself does not tell us what books should even be in the Bible, therefore a Magisterium is needed to decide which books are in the Bible. The Scriptures are not inspired by God because the Church said so. The Church said so because the Scriptures are inspired by God. So why the need for a Magisterium? Because it is the instrument God uses to let the rest of us know. Without it, how would I personally know what is God-inspired Scripture? I didn’t figure it out myself, nor would I trust myself with such a task. Someone gave me a Bible, told me it was inspired by God, and I believe it. So I already accept some sort of authority on this issue. So there is a harmony between Scripture and the Magisterium, not an antagonism. The Magisterium is the channel through which the Holy Spirit announces what is already inspired Scripture. An analogy from Stephen Ray is helpful (links to a Word document). If an archeologist is an authoritative Egyptologist and “discovers” a total of ten Egyptian burial sites, he then, as the authority who made the discovery, “determines” that there are in fact ten sights, and that they are authentic. Discovery and determination are friends, not enemies. Now that the stage is set, we can move on to my simple pondering. On what makes the Scriptures inspired, Protestants agree with Catholics. They agree that the Scriptures are inspired because God said so, not the Church. First point: Can this be proven? Can those specific books of the Old and New Testaments be “proven” to be “God breathed”? I do not believe so. It is a matter of faith. We can study and show them to be historically reliable or show them to be philosophically smart and dependable, but these are not the same as God breathed. I believe C.S. Lewis is smart and dependable as well, but not inspired Scripture. The reality is we accept on faith that the Bible is inspired by God. Next point: This simple faith that Protestants put in Scripture is the exact same sort of faith Catholics put into the Magisterium as well as Scripture. Protestants often demand proof that the Magisterium is infallible. They ask, “How does the RCC determine its own authority? If the church is to be infallible, then it must have an infallible foundation for its infallible authority.” Well, the Catholic would reply that it does. It has the same foundation for infallibility that the Protestants themselves claim for the Scriptures. Can this be “proven”? No more than the belief that Scripture itself is infallible and yet we all willingly accept that. It doesn’t seem like Scripture itself can hold up to the standard of proof for infallibility that Protestants require for the Magisterium. The foundation for both is claimed to be God Himself. Whichever direction one chooses, toward or away from Rome, it is a matter of faith. We all start with a presupposition that cannot be proven and determine all else from that basis. One cannot demand proof from one without holding the other to the same standard. I don’t presume to be correcting you, but I approach it from a slightly different direction. I think you may be the first Catholic to respond to my request for clarification. So thank you! And thank you also for the link. Your points below about what the Bible says about the Church are significant. Having grown up a sola scriptura Protestant, I never could have imagined the Catholic Church if they couldn’t show how the Bible itself speaks about the Church. So not only is the table of contents problematic for sola scriptura, so is the fact that the Bible speaks so highly of the Church. Of course, I had always read those passages with the belief that the Church was “invisible” consisting of only believers. But once I looked at those passages as if they talked about an institutional, visible community everything fell into place and Catholicism made a bit more sense. So I guess we’re back to the presuppositions. Is the Church visible or invisible? Each person’s answer to this question will greatly alter other beliefs. It seems to me that if the Church were invisible, then there could not be any authority in the Church. How could anyone exercise authority over anyone else if the authority itself were not visible, that is, clear and obvious to both the authorities themselves and those over whom authority was exercised? Yet the New Testament is full of statements by authorities who fully expect to be obeyed. See e.g. Acts 15:22-29; 1 Tim. 1:18-20; 1 Tim. 3:4-5; 1 Cor. 5:3-5; etc. Now if it’s clear that there are authorities within the Church in the New Testament, should we not assume that those authorities continued within the Church, unless scripture clearly indicates to the contrary? And if visible authorities continued within the Church – which, judging by the writings of the earliest Church Fathers, they did – then the Church itself must be a visible institution. The authority of man was established by God thru miracles. Even Jesus’s authority in the world was shown to man thru the power of God’s hand. Jesus told the leadership of the church in His day ( no perfection in that ) to look @ the works that God the Father was doing to give testimony of Him. God used miracles to establish scripture we have today. None of these ideas are my own. All that I have shared comes from the truth of scripture. It may be worth your while to read the comment by Agellius above. He made the quick case that the Bible itself shows an authoritative, hierarchical Church. He also gave multiple references from Scripture, which is notably lacking in your comment. Can you show from Scripture your statements? Such as where leadership in the Church “is granted by the people”? Acts 15 is a great example. It was the proper authorities of the Church that determined Christian doctrine; doctrine was not determined by each individual with his Bible. According to the Scriptures they had at the time, circumcision was still mandatory and was not revoked. It was Church leadership—guided by the Holy Spirit—that determined doctrine for all Christians. And as also pointed out by Agellius, we can see that authoritative Church continuing into history.